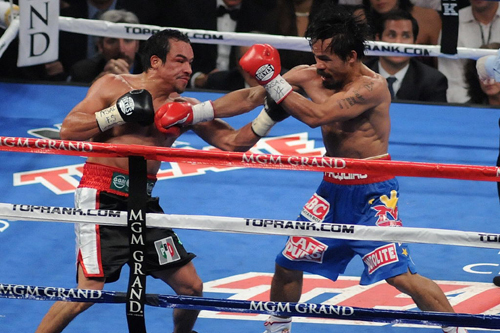 I always said an argument could be made for either side in the first two Pacquiao vs. Marquez fights but I was willing to accept those decisions. There is no argument that can be made for the decision handed down tonight and as I get pelted with beer from the pissed off fans in attendance I have to say the judges in this fight were dead wrong. I can not and will not accept this nor should anyone else, including everyone from Team Pacquiao. 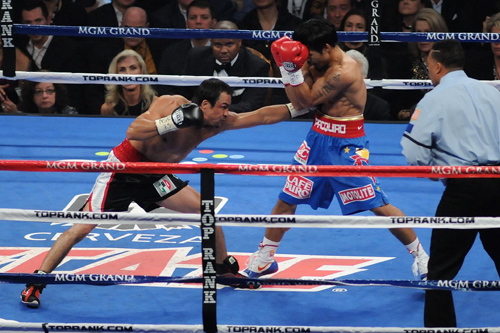 Juan Manuel Marquez (53-6-1,39 KO’s) boxed beautifully and exposed so many of Manny Pacquiao’s (54-3-2,38 KO’s )flaws, he made Manny miss his left all night long and countered those shots with clean punches of his own. Judges Glen Trowbridge, Dave Morretti and Robert Hoyle should all hand in their walking papers and never be allowed near a ring again. This was as disgraceful as it gets. Anyone who watched as the final bell rang saw a dejected Pacquiao go to his corner and bury himself in his entourage while a jubilant Marquez raised his arms in victory…and rightly so. Its no longer funny and it’s not a joke, Mr. Kizer, leave your phone and and expect the deluge to begin. There are going to be a lot of irate fans and media and we want answers. Officially Manny retains his WBO welterweight title with scores of 114-114, 115-113, 116-112 to take a majority decision.